The author of this book, Dennis William Hauck, is a practicing alchemist versed in both Eastern and Western techniques of alchemy and widely recognized as one of the world’s leading experts on the ancient art and the benefits it offers contemporary practitioners. Now, in Sorcerer’s Stone, the first basic primer on the subject, he makes alchemy’s secrets and powers accessible to everyone with the desire to experience physical, mental, and spiritual transformation. 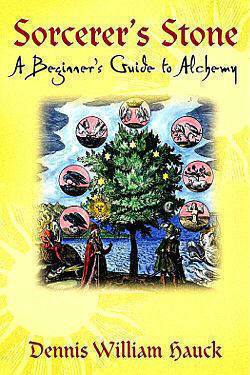 By providing clear explanations, moving meditations, and hands-on experiments making tinctures and elixirs, this beautifully illustrated guide passes on the knowledge and creative energy of alchemy’s magnificent discipline—sending a golden arc of learning from thousands of years in the past into your life today. Moreover, Hauck makes clear that alchemy is a means of personal transformation that enables you to meet your highest potential as a human being. Although the alchemists spoke in terms of vessels, furnaces, and chemicals, they were really talking about changes taking place in their own inner nature. They worked with the archetypal energies of metals to change their own “temperament” from lead to gold – to rejuvenate their bodies, integrate their personalities, and perfect the very essence of their souls. The bizarre drawings and cryptic writings of the alchemists refer to specific operations that work on all levels of body, mind, and spirit. Today, enlightened physicians and healers are demonstrating that alchemical methods can protect and rejuvenate the body and even heal brain and spinal cord injuries. The book includes an extensive glossary and resource guide.